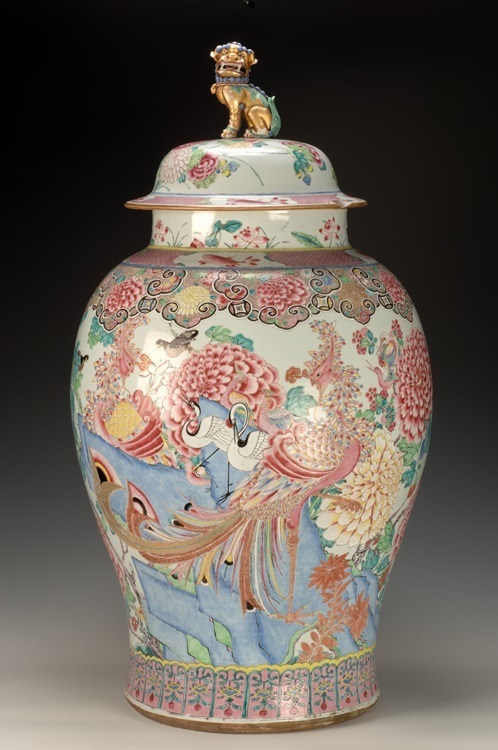 Pair of finely and elaborately painted and gilt covered vases with phoenix and cranes amidst large blossoming peony and rock work, Lappets encircling the spreading foot and a ruyi collar at the shoulder with a narrow band of fish and diaper and lotus plants at the rim below. The domed cover similarly decorated and surmounted by gilt and painted Buddhistic lion/ Fu Dog finials. Made during Qianlong Dynasty (1736-1795). Purchased by James B. Duke for his 78th Street, New York apartment, prior to 1925. Moved to Rough Point after 1958.